Two women have been photographed vandalising a new World War One memorial, with their children watching. The mothers were caught writing ‘Shell’ and ‘Jane’ in wet cement underneath a bench commemorating heroes from WWI, as their children watched on. 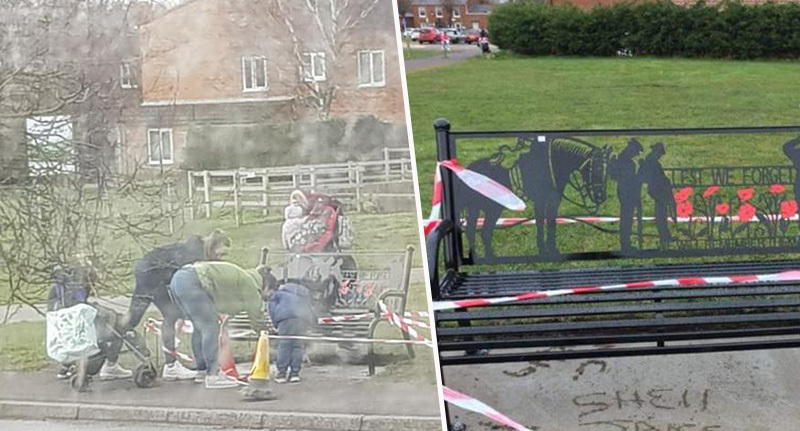 Locals shared images of the vandalism on the Horncastle Community Page on Facebook, branding the women in Horncastle, Lincolnshire, ‘an absolute disgrace’ and ‘disgusting’. As reported by The Sun, the women scrawled their names into the cement a day after the bench had been installed. Workmen installed the bench outside Stanhope Hall, off Boston Road, on Monday February 18, with the pair defacing the memorial the next day. Police have spoken to one woman in relation to the crime, adding that investigations are ongoing. The mayor of Horncastle, Brian Burbidge, told Horncastle News the crime has left him disappointed and saddened. I am deeply saddened that, after much work by a great number of people to commemorate the end of the First World War and to provide the commemorative bench as a lasting memorial, its installation has been mistreated in such a way. I can only hope those responsible will learn to appreciate that the bench was placed there to commemorate the sacrifices made by so many during the First World War. A spokesperson from Horncastle Town Council described the crime as ‘disappointing’ to the local news outlet. They added that while the bench is fine, the concrete underneath it has had to be relaid. Town and district councillor Fiona Martin chaired the group that organised a weekend to commemorate WWI heroes in Horncastle last November. I am very saddened and angry that someone has seen fit to vandalise the setting of this commemorative bench by writing in the wet concrete. I feel this is disrespectful to the people from Horncastle who lost their lives that this bench remembers. The bench was brought as a permanent memorial with funds raised from local businesses, voluntary groups and the town council following the successful commemoration weekend last November. This design was chosen particularly as it incorporated war horses and seemed appropriate because of Horncastle historic horse fair. The incident is being treated as criminal damage.